I have a Bucket List. I suppose everyone does. At the top of that Bucket List is Machu Picchu. Right below it is Angkor Wat. But flights to those two destinations are expensive and long. So those exotic places are going to have to wait a while. Which is why, when I saw there was a show about Angkor here in Paris, I got out my subway pass and I was off to the 16th arrondissement and the Musée des Arts Asiatique Guimet. Guimet’s collection covers artworks of just about any Asian nation you could name - from India, Afghanistan and Pakistan to Japan and Korea, from the Himalayas to Vietnam. After all, France was one of the three great colonial powers of the past, alongside Great Britain and Spain. A huge swath of southeast Asia flew the French flag under the name Indochine (Indochina): Vietnam, Laos and Cambodia. In addition, Louis XIV, the Sun King, had also built trading settlements in India: Mahe, Chandernagor, Pondicherry, Karikal and Yanam - names all French children once had to learn in grade school. So what could be more normal than that Asian art, at least from these areas, should find its way into French museums and private collections? I’m not sure, but I think the first time I heard of Angkor Wat was in college. As a French major, I was subjected to an inordinate number of Gallic books, one of which was André Malraux’s La Voie Royale (1930). In it, the “heros” penetrate the Indochinese jungle to steal bas-reliefs from ancient Khmer temples. And the author should know about that, because Malraux himself went to Cambodia in 1923 under the pretext of taking molds of Angkor Wat for the self-same Musée Guimet and instead sawed off statues and bas-reliefs with the intention of selling them to collectors he had already contacted. He was arrested in Phnom Penh and sentenced to over a year in prison, but his wife rallied the French intelligentsia who put so much pressure on the government that he was released after only three months. In spite of that buccaneer-ish start at age 23, Malraux nonetheless ended up as Minister of Culture in the DeGaulle administration and his body now reposes in the Panthéon alongside other great intellectuals such as Voltaire, Rousseau, Hugo, Dumas and Zola, as well as Marie and Pierre Curie. But I digress. Back to Angkor Wat. I meet a friend in front of the museum and we find the temporary exhibit on Angkor, which is on the downstairs level. Much of it consists of drawings made by a certain Louis Delaporte, who must have ruined his eyesight on them, judging by his meticulous renderings of the ornate temples. All those tiny lines! Amazing! Not one is missing. How can I tell? Because near the drawings are the actual molds taken of the bas-reliefs during the expedition. And it’s a good thing those molds were cast, because between Malraux and other art marauders hacking off parts of the decor, and later the Khmer Rouge using the statues for target practice during their deadly occupation of their own homeland, not to mention erosion from centuries of monsoons and fractures caused by the roots of sprouting trees and vines, there’s not a whole lot of original detail left today. In addition to Laporte’s drawings and the moldings, there are also actual statues from the 10th to the 13th century, some ornate, others touching in their simplicity. I’m not terribly familiar with the culture of Cambodia and not knowledgeable enough to recognize which of the gods is which. But there is so much to see in the bas-reliefs, and such beauty in the simple busts, that it doesn’t matter. The flow of the lines carries the eye from one detail to another. A quick look at some of the literature explains to visitors that Angkor Wat was first a Hindu temple dedicated to Vishnu, then later a Buddhist one, which explains a bit of the dichotomy of the gods depicted. It was built by the Khmer King Suryavarman II early in the 12th century, which makes it even more amazing that anything at all has survived, given the threat of encroachment by the surrounding jungle. It’s the largest religious monument in the world, and has become the emblem of Cambodia, even featuring on the national flag. The show also flows over into other Cambodian temples, such as the one at Bayon famous for its huge Buddhist heads looking to the four corners of the universe, with even more Asian art treasures above on the other floors. The Guimet Museum first opened its doors in 1889 and houses the largest collection of Asian art outside of Asia. It’s well worth a visit. Plan to stay a while. I don’t mean prepared with snow boots and snow shovels and ice for the driveway. I mean prepared in my head. When I was a little girl I lived in western New York, which New Yorkers call “Upstate”, even though it’s not “up”, but more “to the left”. Between Rochester and the Finger Lakes, to be exact. 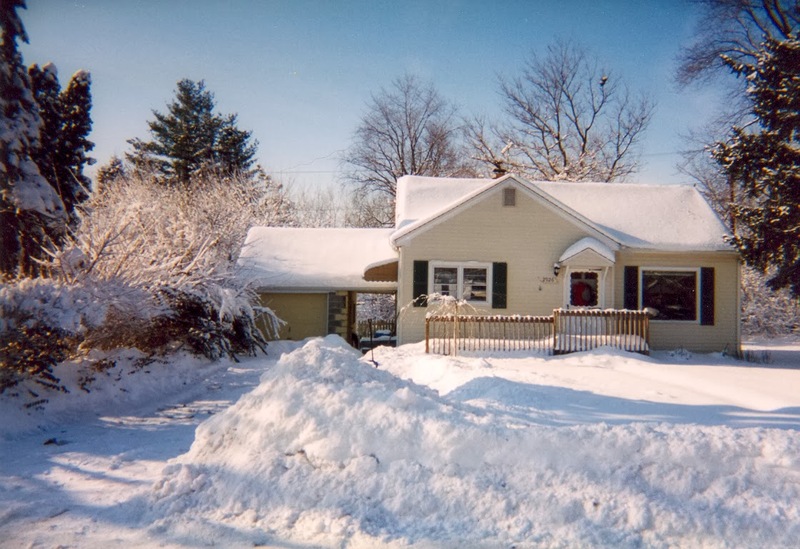 If you like snow, that’s the place to be in winter: in a northern state, and east of a Great Lake. You want snow? You got it! The clouds travel over Lake Erie, picking up water as they go, and when they hit land.... bingo!... snow. I was shorter then, so the snow probably seemed higher up my young legs. But it wasn’t just an illusion. The average snowfall for that part of the world is between 92 and 115 inches (2.3-2.9 m), with annual fluctuations. On a chart of the top 101 cities in the entire United States (Alaska included) having the highest average snowfall in a year, Numbers 1, 2, 4, and 7 through 12 are all in that general geographic area. So I knew about snow. When we moved to southeast Michigan, the snow seemed piddling in comparison. And then I moved to Paris. All of the sudden, no snow. Over my thirty-some years in Paris, green winters were transformed from a puzzlement into the norm. And then I moved back to Michigan for part of the year. Including part of the winter. Which is why I’m sitting here, looking out the window, on the 14th of December, as the fifth snowfall of the year blankets everything in what is already 4 inches of snow... and will probably keep accumulating for 12 more hours. Years ago, my daughter was born on tomorrow’s date and the window of the hospital was cracked open. A ladybug flew in and landed on the sheet as she came into the world... a sign of good luck in West Indies culture. The window will not be cracked open tomorrow. The sky will still be low, the thermometer as well. There have been many winters between that first French one of the lush green grass and the one outside my Michigan window today. Most of them I gazed on from my fifth floor apartment overlooking the gardens of the Sacré-Coeur. 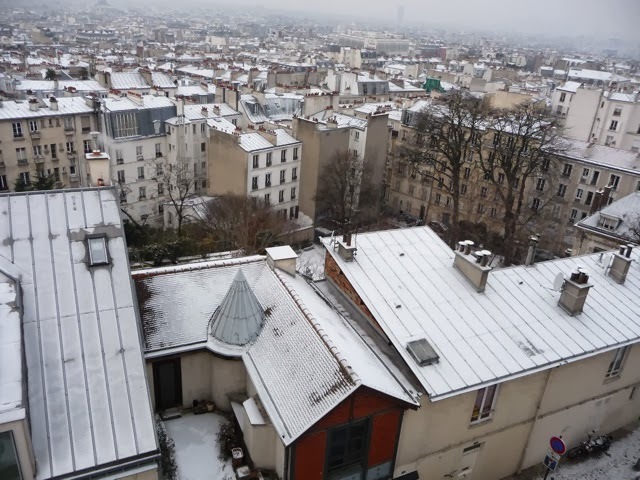 Paris winters don’t usually involve snow. And when they do, the snow rarely lasts more than overnight, or occasionally a day or two. In 1970, it lasted a week and no one knew what to do. I was still fresh from my North American training so I found it only bothersome because I didn’t have the right boots and it was the slushy kind of late March snow that ruins shoes. I was living eight floors up then, in a tiny maid’s room with a view out over zinc rooftops the same grey color as the sky. It was just boring. Then came the move to Montmartre and the park view. Whenever it would snow, the park guardian would come and lock the gates. Of course, they were only about waist high so it was fairly easy to climb over them - and people did - but at least the city wasn’t responsible if you hurt yourself; they had done their due diligence and you were trespassing. People would come with pieces of cardboard and slide down the slopes. Some even strapped on their skis. I laughingly called the Funiculaire that usually ferries tourists to the top of the Butte “our ski lift”. It was a fun scene to watch, and when he was older my son even climbed the fence one night and made a snowman. 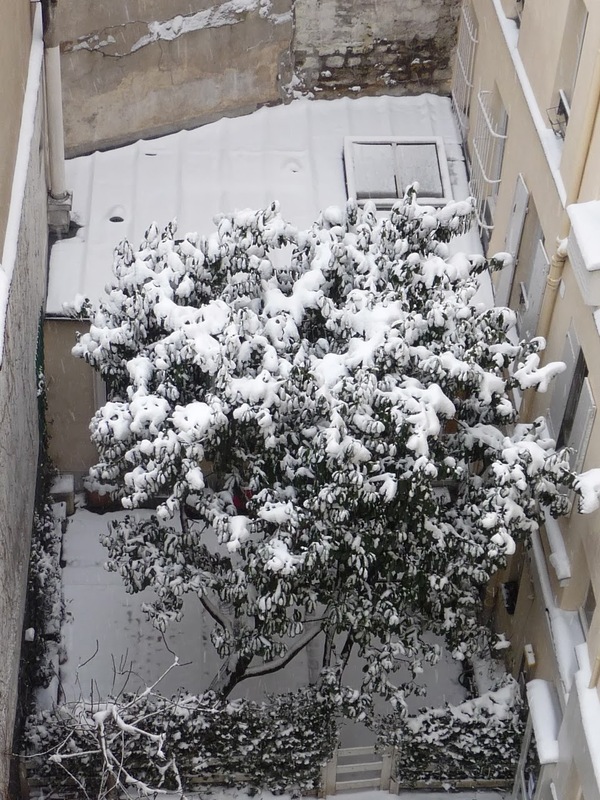 Lately, winters have been getting more snow-filled in Paris. Two years ago, friends were sending me videos of people snowboarding the sloping, winding streets of Montmartre. 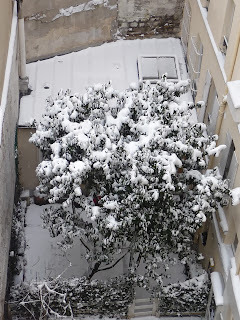 And last year the cold lasted long enough to kill most of what until then had been winter-hardy plants in my new apartment’s garden, probably because it got cold before any snow fell to keep them warm. (I’ve never quite understood how snow could keep things warm, but evidently it does.) This winter promises to be more of the same. Why, it even snowed in Cairo, Egypt! Ah, ma brave dame, il n’y a plus de saisons! Yes, dear lady, the seasons have gone beserk! So I’ve just brewed myself a hot cup of Earl Grey tea and I’m sitting by the window, watching the snow fall as dark descends. It’s very quiet, because snow has excellent muffling qualities. And it’s beautiful. But I’m just not ready for four months of this. And tomorrow there’s a snow shovel with my name on it so I can get to the mailbox to collect all those Christmas cards. I think I’ll call the airlines to check on flights to Paris. Christmas in France is a family affair, and the big meal is served Christmas Eve, after Midnight Mass. Or it used to be. Nowadays it’s often served, as in America, on Christmas Day after the presents are opened. 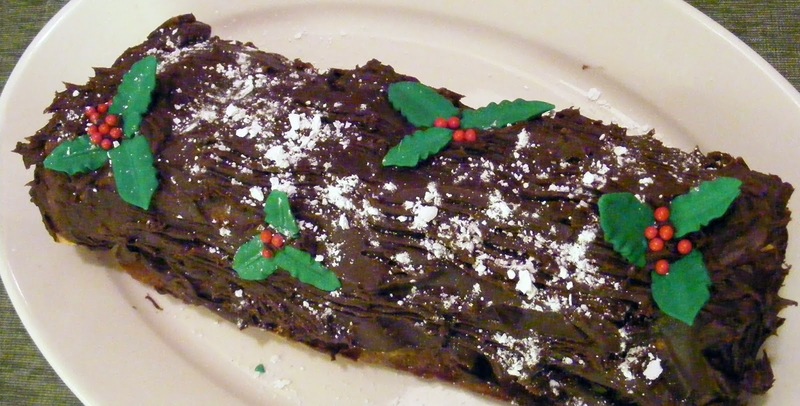 The traditional dessert is a bûche, of many different recipes, all of which are complicated to make. Christmas also means candied chestnuts (marrons glacés), but above all chocolates. Some of my favorite memories are of hours spent watching pastry chef Bernard Bertheau make them himself in the basement of his shop in Montmartre. It was cramped by modern standards, and a lot of the equipment dated back to his start in the trade sometime shortly after World War II. But it was brightly lit and spotlessly clean. I would pick my way down the narrow, winding stairs and hear him moan “Oh non, l’Américaine!”... with a big smile on his face. Monsieur Bertheau loved to tease and he adored anyone who shared his passion for pastry and chocolates. I never failed to be amazed by the speed and sureness of his movements, and by how he always knew when the melted chocolate was too cold to work. He’d pop the tub back in his huge pastry oven for just a few seconds, pull it out, stir vigorously, drop in almonds or candied orange peel, then take them out one at a time, stuck on his fork (making that trademark three lines on the chocolate coating) and leave them to cool on the marble work surface. He was proud of his handiwork, and I think he enjoyed “catching” me pop one into my mouth. I’ve never tasted chocolate so good! One day Monsieur Bertheau retired and sold the shop. I inherited some of his vintage chocolate molds, but so far I haven’t screwed up my courage to try using them. His act is just too hard to follow. I visit him and his wife in their new home in their native Loire region. It’s been almost twenty years, and he hasn’t made a pastry or a chocolate since the shop closed. But then I guess he made enough of them in his fifty-year career to last a lifetime. Still, I wish he would. And invite me. 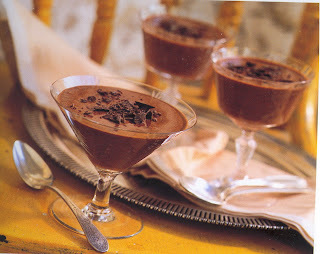 There are as many recipes for mousse au chocolat as there are cooks. Light and fluffy with milk chocolate, heavy and creamy with dark chocolate... With or without liqueur. And everyone likes their own best. This is Monsieur Bertheau’s version which is easy and fast to make. I hope you enjoy it as much as I have. - Select a 2-quart stainless steel bowl and a saucepan large enough so that the bowl fits snugly on top. Pour boiling water into the saucepan and set the bowl on top of it. Keep the water at a simmer. - Add the chocolate and butter to the bowl. Continue stirring until well blended, then remove the bowl from the saucepan. - Add the sugar to the egg yolks and mix with a wooden spoon until they are frothy. - Mix the egg and sugar (and optional liqueur) into the chocolate, and stir until thoroughly blended. - Place the bowl briefly in the refrigerator until the mixture is slightly cooler than lukewarm. If it becomes too chilled, it will harden, so don’t let it get too cold. - Beat the egg whites until they are stiff. - Fold the whites into the chocolate mixture until it’s all the same chocolate-ness in color. Do not beat or stir them or the egg whites will “fall”. - Spoon the mousse into 4 ramekins. You can decorate it with a sprinkling of chocolate shavings, almond slices, cinnamon, mint sprig, or anything else your imagination whispers in your ear. - Chill briefly until ready to serve. P.S. This is a good recipe for lactose intolerant people, as there is neither milk nor cream, only butter, which could, I suppose, be replaced by a non-dairy substitute. But that would be a shame. And if you do see both, I’d advise seeing Vallotton first. 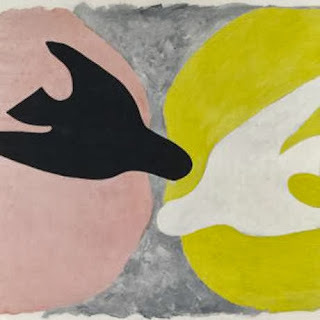 Braque is a bit more abstract visually, more demanding. Vallotton will feel more comfortable. I already covered Vallotton (see Oct. 26, 2013), so now let me have a go at Braque. Georges Braque wasn’t really my cup of tea. But then I didn’t know all of his repertoire. There’s a lot I still don’t like, but I have a broader view of his life’s work after this exhibit. His earlier pieces appeal to me more because they’re more... approachable. I find it hard to relate to something that looks like a piece of Ikea furniture waiting to be assembled, and that’s what a lot of Braque’s cubist works are like. Born in 1882, Braque’s foundations already included Impressionism, which was old hat by the time he took up canvas and oils. So he needed something else. Something new. Then before he was even 20, he discovered fauvism, with its emphasis on strong colors and refusal to be concerned with realistic representations. In French, fauve means “wild animal”, and the wildness was what artists of this genre were after. Braque’s early works were filled with color, whether it be landscapes like Port de l’Estaque or nudes such as Nu assis. Braque was an admirer of Cézanne and that’s visible in Le Viaduct d’Estaque. But when he turned away from this style, he destroyed most of his canvases. Luckily, some had already been sold or gifted, and those are the ones that have come down to us. As he turned away from fauvism, cubism was creeping into his works. By the time he painted Tête de femme in 1909, he was already more geometric, more like Picasso than Cézanne. And from there, he moved on to what he called “analytical cubism”, a style used only by Picasso and himself in which parts of an object were meant to represent the whole object... and that’s where he starts to lose me. I guess I’m not analytical enough. After that came “synthetic cubism”, which tried to counter the flatness resulting from geometric simplifications by adding real objects to the canvas. In other words, he combined oils and collages, gluing real objects onto his canvases. During these periods, he turned away from bright colors and focused on browns and greys, which also aren’t really my colors. What I do like about Braque is his sculpture. Not so much the little horsies of all shapes, yet basically the same one. But his bronze horsehead, which - unrealistic as it is - still reflects the motion of a horse in stride. Just look at the mane streaming out behind. And his Hespéris is a magnificent blend of Picasso and a Mayan statue. I don’t understand the name, because hesperus is “a flowering plant of the mustard family” that looks a bit like a violet. Maybe he just liked the sound of the word. Somewhere in all that, Braque was called up, sent to the front lines and seriously wounded in World War I. After his trepanation, it took him an entire year to paint again. Then a decade later he worked with Diaghilev and the Russian Ballet, creating both sets and costumes. And in 1953 he painted Les Oiseaux - The Birds - for the ceiling of one of the rooms in the Louvre Museum. After accomplishing all this, and after returning to bright colors, George Braque died in 1963. Although this visit to the Grand Palais didn’t make me enjoy all his works, it did teach me a lot. And there were enough canvases I did like to make it worthwhile. Besides, he, like me, lived in Montmartre - and just around the corner! - so maybe that makes us kindred spirits under the skin. My recent trip to Paris lasted seven weeks. Which gave me time to see four plays of various genres. Here’s a short resumé. I already talked about this play earlier this year (Playtime in Paris, Feb 26) so why go see it again, you ask? Well, because it’s performed by friends who came and did Rhinocéros at the University of Michigan. One of that cast, Gérald, offers me a ticket and the Théâtre de la Ville - Abbesses is right down the street, so yes, I’d love to and thank you very kindly. As I said in February, this “play” is actually a mélange of five Ionesco works. The troupe has been together for almost a decade, and they’ve studied all of Ionesco. One day director Emmanuel Demarcy-Mota asked his actors to choose a text that spoke to them and work on it. Then those texts were structured and woven together to turn the spotlight on explosive social situations such as weddings, family reunions, and birthdays. All this with minimal sets, multiple costumes, heavy make-up and a stage as close to theater-in-the-round as possible. The result is hilariously absurd... which is something Ionesco would approve of. After the play, I wait outside to thank Gérald. We end up with more of the cast and crew at a nearby café. (It is France, after all.) I tell them I remember the play having seven actors and there were only six; they answer that one is on tour with another play so they reworked the script. Then I admit I don’t remember the bit with the cake dropping on the floor, and was that an “oops”; they reveal that it’s a new bit they worked in lately. I’m relieved I’m not losing my memory and tell them how wonderful I find it that they can keep it fresh. “We’ve been together a long time,” comes the reply, with a smile. Out of the blue, friends call and say they’re passing through Paris. And would I like to go to see a play with them? 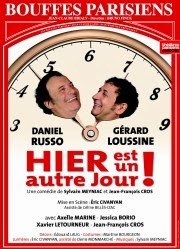 So we meet for dinner near the theater and then on to the Bouffes Parisiennes for a romp that borders on the slapstick at moments but is well-acted and executed like clockwork... until the star gets so taken up with his role that he cracks up himself... and that rebounds on his co-star. It takes them a good minute or two to pull themselves together, but as we’re all laughing too, it doesn’t matter. The star role is played by Daniel Russo, who has done plenty of stage and screen but I don’t recognize him when he walks on-stage to the audience’s applause. Then he opens his mouth and I recognize the voice that dubs Harvey Keitel, Danny DeVito, Bob Hoskins and John Travolta in France. The plot is simple. A lawyer is about to close the deal of his career and get a promotion. Caught up in the moment, he inadvertently runs a will through the shredder and from that point on strange things start to happen... and a strange little man appears at his office door. Somewhat like Groundhog Day, people start saying the same thing, doing the same thing, again and again. It gets crazier and crazier until it’s almost too slapstick for my tastes. Still, it’s a well-oiled machine - except for the fou rire laughing episode - and a good time is had by one and all, both in the audience and on stage. The same friend who turned me on to the Vallotton exhibit (see Oct. 26) has suggested we go see this play, whose subtitle is “... or the True Made-up History of the First Ladies of France”. It opens with Anne-Aymone, wife of President Valéry Giscard d’Estaing, having to pack up her things and leave the Elysée Palace, the French White House, before her successor arrives. Come to help her is the First Lady she once replaced, Claude Pompidou, accompanied by a friend who turns out to be Bernadette, the wife of Paris Mayor Jacques Chirac... who we will see later on when she in turn becomes First Lady. In between the two, Danielle Mitterrand, with her leftist activism. And the sparks fly. The cast includes two other characters. There’s the long-suffering maid, Linotte/Soizic, who has to cater to the whims and differing temperaments of all these First Ladies, and has the most diverse role in the play. There’s also a person I’ll call Mr. Interlocutor, who pops out from behind the curtains to sing songs as the sets are being changed backstage and to introduce the next scene with "Et pendant ce temps-là... au palais " (Meanwhile, back at the palace...). He’s really very funny and has a talent for seguing from talk into song so subtly that you don’t notice it at first. Plus he has an amazingly flexible face that molds into many different expressions. This isn’t a play for people who aren’t familiar with the past French governments because that’s its whole point. But if you are, this one’s for you, at the small Théâtre des Béliers near the City Hall of the 18th arrondissement. Even though it manages to get its barbs in concerning modern French society, this last play is similar to the second in that it’s théâtre de boulevard, even if it’s not running on the boulevard. All that the term means is “light fare”, as opposed to drama. Its sole purpose is to entertain, and that it does. In spades. Both Berry and Auteuil were born in 1950. Both started their acting career in the early 70s. Both worked their way up to the top of the line-up as triple-hitters: stage, screen and TV. Both have worked not only in front of the camera but also behind it, as director and as screenwriter. But they have rarely co-starred in films and never before on stage. This comedy was written specifically for them to star in together. And Berry is the director. So it’s a real event. And the theater’s full. The plot? Three old friends with very different personalities get together every week to play poker and talk about the women in their lives. And the conversation isn’t always flattering. On this particular night, Paul and Max are waiting for Simon, who is never late. When he appears, he’s been drinking and announces that... he’s strangled his wife! Simon then passes out and the next hour and a half is pretty much a frenzied discussion between Paul and Max of whether to turn him in or lie for him. The verdict goes back and forth with Berry and Auteuil playing it to the hilt (and losing it twice in the flurry, but picking it up again with a quip). I think the highlight was Berry’s version of break-dancing, and his ensuing hobbled walk across stage, although Auteuil’s explosive character steals the scene at other moments. It’s very physical comedy and by the time the play’s over both have sweat soaking through their respective shirts and the audience is in stitches. A standing ovation for a job well done. These are craftsmen with a sense of timing and nuance that knows no equal. Well today is Monday, but it’s not Brussels. Yet. I’m at the Gare du Nord waiting for the train. At ten minutes to departure the platform’s still not posted. It’s easy to spot the train - it’s chocolate brown and has Thalys on its side - but there are two of them, side by side. Which one’s mine? The one with the attendants standing nearby, I decide. And yes, it is so I get on. Forty minutes later we finally leave. Electrical problems with the locomotive. That’s better than what I feared: a tree fallen on the tracks in the overnight near-hurricane that the French dubbed Christian and the Brits called St. Jude. Across from me at our four-seat table is a Belgian lady with young twins. All the way to Brussels she reads the boys a story in Flemish. I can’t understand a word but she does such a good job with the different voices, not to mention the special effects, that I feel I almost do. On the four-top across the aisle is an Italian family with dog and child. The boy spends the whole trip drawing and coloring. We’re a very genteel and international group in this train. And the friends I’m going to see have a four-year-old daughter who speaks German, French and very passable English. Like I said, very international. We zip across the flat northlands of France. Outside the window it looks like a Dutch masters landscape, except when we pass the ultra-modern Roissy CDG Airport. The trip is a short one: just an hour and a half. After all, Paris to Brussels isn’t far and we are traveling at over 100 mph. My cellphone beeps and flips to roaming, which is how I know we’re in Belgium now. Borders disappeared with the creation of the European Union. No more showing of passports required. Or changing of money. A few minutes later we pull into the Gare du Midi station (Brussels speaks both French and Dutch) and my friends meet me on the platform. Off we go to their house, dinner and bed. After a good night’s sleep and a morning spent with my friends, I’m off on a quest: the Musée Royal de l’Afrique Centrale. This museum is made up of all the things Belgium brought back from its years of rule over Central Africa. King Leopold II started the ball rolling in 1884, when he was given the Congo River Basin in the Berlin Conference thought up by Otto von Bismarck. Then after that self-same Bismarck’s Germany lost in World War I, its colonial holdings were divvied up between the European powers and Belgium got what is now the Congo, Rwanda and Burundi. A tidy little parcel of almost all of Central Africa, with its natural riches of diamonds, copper and cobalt but also petroleum, gold, silver and uranium. Some would say Belgium pillaged its colonies. Others would say the objects they brought back have found a home where they’re safe and admired. All I know is that I want to see them. And have for some time. I’ve visited Brussels often since I heard about this Museum. But it’s always been on Monday, and on Mondays it’s closed. Or there wasn’t time, because it’s a fair hike outside the city limits. But today’s the day. Because it’s October 29 and at the end of November the museum will close for three years of renovation. A brand-new modern building will be built nearby, with an underground gallery connecting it to the existing 1910 building, which their brochure calls “charmingly unique”. I find it lugubre, a French word that means gloomy. It’s dark and dim and really fossilized. I hope the architecture will remain “charming” but the displays will be totally modernized. During those three years, the museum’s artwork will pop up around the world as traveling exhibits and the staff will either be transferred elsewhere or have to find other employment. One advantage for me is that everything in the museum shop is half-price or less! There are many parts to this museum. There’s a history section, but I only give it a glance because I’m not a big fan of colonialism and the juxtaposed statue of a “native” and the bust of a Belgian noble makes me uneasy. (Maybe this is one facet of the museum that will disappear with the remake?) There’s another section on agriculture and forestry, the cornerstones of Central Africa’s initial economy. There’s yet another on geology and mineralogy and one last section on zoology. These are the parts that really need a good dust-off and rethink. But the ethnography department is the one I came for. It groups the museum’s African art and runs the entire length of the building, along the beautiful gardens and their forest backdrop. And right away I wish I knew at least as much about the various ethnic groups that make up this vast area as I know about those from West Africa who lived under the French flag. I see names that I don’t recognize: a Ngbaka pipe, a Luba chair, a Loi slit drum... And looking at the tags, I wonder how many times they’ve had to be reprinted as Congo Free State became the Belgian Congo, then at independence the Republic of Congo and then the Democratic Republic of the Congo until Mobutu’s more African Zaire (which frankly is shorter and eliminates any confusion with Congo-Brazzaville) and finally back to the Democratic Republic of the Congo, or DRC which fits neatly on the little tags today. The Musée Royal is a flashback to the museums of my youth: overly didactic with little context. A museum for the initiated. So I focus on the beauty of the objects. Amazing masks, often with intricate beadwork and feathers or raffia hair. There’s even a complete buffalo dance mask, which is really a raffia suit of several pieces and a carved buffalo head. There are everyday objects, such as carved stools, bowls and pipes. And my son would adore all the African musical instruments crowded into two huge display cases. I write down all the details carefully... and then lose the paper on my way back to the house. Getting to the Musée Royal and back is an undertaking. From where I’m staying it’s almost an hour in all: a bus to the tram, the tram to the end of the line, and finally a short walk. The tram line cuts through the edges of one of Belgium’s largest forests, the Forêt de Soignes. The colors are beautiful this time of year, even if the light is fading - Brussels is as far north as Labrador - and another storm is brewing. But the air is crisp, it hasn’t rained on me - yet - and the beauty of all those artifacts really was worth it. Completely tuckered out from the to-ing and fro-ing, and the trepidation of not getting lost, there’s just time for a slight rest before dinner. Then it’s back to the train station and Paris. On the subway, I realize how easy the Paris Métro is to follow. In Brussels the lines loop around, and you can have the same name on a subway going in both directions. When I change lines, I almost make that mistake and head the opposite way from where I want to go. But I make it to the station in time to have caught the train before mine. There seems to be one every half hour at this time of night on a weekday. This is the corridor that links up Paris, Brussels, Rotterdam and Amsterdam. A bit like the Northeast Corridor from D.C. to Boston in the States. My train comes rolling in from the north right on time and only pauses for about three minutes. There’s some jostling among natives and mild panic among tourists, but everyone gets on and we slip quietly south across the border and into Gare du Nord five minutes early... to make up for part of the 40 minutes lost on yesterday’s trip up. It’s been a hectic 30 hours, and I didn’t even get to the Grand-Place or have any moules-frites (steamed mussels and French... I mean Belgian fries). I’ll just have to go to one of the Léon de Bruxelles restaurants in Paris. But I did see my friends in their new home and I did finally get to see the elusive Musée Royal de l’Afrique Centrale and fill my eyes with wonderments.